To talk about a Star Wars movie experience you have to start even before the characters appear on screen. At the opening we get the thrill of the “A long time ago…” caption followed by the triumphant appearance of the yellow title logo we know and love (modified with the new title, obviously.) We’re pumped. But instead of a crawl, we get a voiceover reminiscent of a 1940s newsreel. It’s just as boring. As in the other films, this one doesn’t weigh us down for too long with talk of trade blockades and treaties, although it does start off that way. 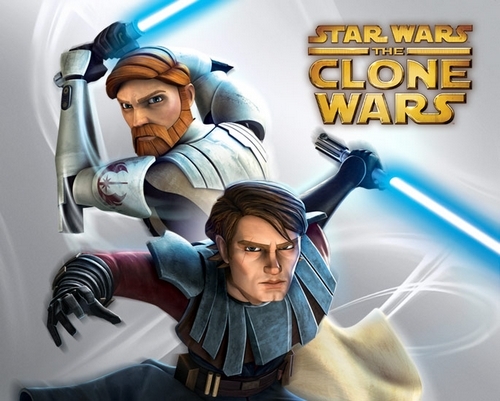 We jump into the action of battle as Obi-Wan (James Arnold Taylor) and Anakin (Matt Lanter) lead a corps of Clone Troopers against some spindly-legged robots (which look a lot like the robot from The Incredibles). Once our Jedi heroes dispatch with the enemies they discuss the impending arrival of Obi-Wan’s new padawan. Right on cue, the new character Ahsoka (Ashley Eckstein) shows up–only Yoda has assigned her to train with Anakin, not Obi-Wan, much to Anakin’s chagrin. Thus we get our Reluctant Partnership, staple of cop shows and romcoms. The first thing we notice about Ahsoka, besides that she looks like the victim of spray tanning accident, is that she’s really freaking annoying. Sure, she’s supposed to annoy Anankin, but why us? Just thank the Force they don’t mention her midichlorian count. The other character to be introduced is from a separtist Sinead O’Connor-looking creature called Ventress. There is not much to say about her at this stage except she’s bad. After Act I we move on to a plotline where the Jedi have to rescue Jabba the Hutt’s infant son. (Which begs the question, how do Hutts reproduce?) It turns out the rescue mission is a frameup by Count Dooku to make it look like the Jedi are trying to kill the mini-Jabba. Padme Amidala comes along to assist. She looks and sounds pretty cool, probably the least cartoony, if that makes sense, of all the characters. There is just the briefest reminder that Padme and Anakin’s relationship is a secret, which sets up lots of possibility down the road for series plotlines. It is when her character is introduced that we get some variety to the action, cutting between her scenes and Anakin’s. You can’t even call it a subplot – the story is pretty much one thread. So what works and what doesn’t about this pilot? The good: Obi-Wan, a consistently interesting character from all six previous films is back. Yoda looks fantasic animated. And Anthony Daniels as C3PO. The bad: Samuel L. Jackson as Mace Windu. Doesn’t he have other stuff to work on? Can’t he go away and let us forget that “This party’s over” ever happened? Possibly the biggest problem with this is that it can’t seem to decide whether it is for kids or adults. It’s like what happened to Return of the Jedi with all the Muppets, and to Phantom Menace with all the Gungin nonsense. The best thing, though is this: After years of hearing about the Clone Wars, we actually get to see the Clone Wars! The show has certainly found success, with season 3 set to begin in fall 2010, and enough merchandise to choke a Hutt. This entry was posted in 2000s, Animation, Dramas and tagged ahsoka, anakin skywalker, clone wars, obi-wan kenobi, star wars by meekthegeek. Bookmark the permalink.